Although this watercolour was amongst items passed down through the family of John Soane junior before it came to the Museum in 1930 it seems certain that it is by Joseph Michael Gandy, in whose office Soane junior worked very briefly. 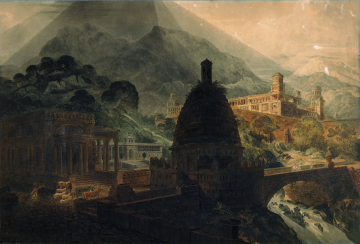 It has been identified by the Gandy scholar Professor Brian Lukacher as Bridge and Palace in the Platxenses [exhibited at the Royal Academy under Gandy's name in 1817, No. 903 Bridge, etc., Platxenses].